The California Assembly is pushing to expand the use of gun violence restraining orders after Friday’s school shooting in Texas. Democratic lawmakers on Monday passed legislation that would allow teachers and school staff to request temporary confiscation of a person’s firearms. 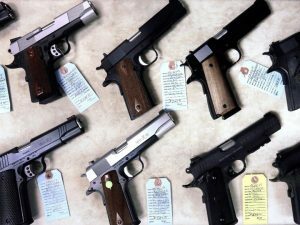 Employers and co-workers at businesses could also request gun violence restraining orders, under the bill. Friday’s school shooting in Texas framed the debate. “I really do ask that we don’t just send thoughts and prayers, but that we send some action to students, to families who really are scratching their heads and asking what we can do to stem the violence in our schools,” said Democratic Assemblyman Phil Ting, the measure’s author. Republican Assemblywoman Melissa Melendez objected to the connection between the bill and the 17-year-old accused of the shooting. Currently, only family or law enforcement can ask a judge to temporarily confiscate a gun owner’s firearms. Democrats in support of the bill called it a logical expansion of the restraining order program, because employers and co-workers often spend more time around each other than they do with their families. “We will allow those most often in the position to identify that a person who is a danger to themselves or others to request a gun violence restraining order,” said Democratic Assemblywoman Eloise Gómez Reyes. Republicans questioned how well employees know each other, particularly at large companies. A previous version of the measure also allowed mental health professionals to request restraining orders, but Ting says he removed this at their request. Gun violence prevention groups, including the Brady Campaign, support the bill. But two powerful advocacy organizations oppose it: the National Rifle Association and the American Civil Liberties Union, which cites concerns about judges ordering the removal of weapons without allowing the gun owner to testify. Judges who take that step must allow a hearing within 21 days, according to the measure. Brown rarely weighs in on how he will act on a measure until it reaches his desk, but Ting argued that, two years later and with high-profile shootings continuing, circumstances have changed.